OM4 LC LC Fiber Patch Cable | LSZH Blue Duplex 100Gb 50/125 Multimode Jumper Cord. 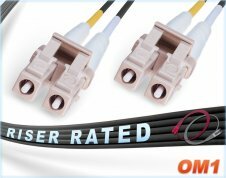 Laser optimized multimode fiber (LOMMF) with duplex, small form factor ()sff), 1.25mm ceramic ferrule, LC fiber cable connectors. Assembled with high bandwidth, Corning 50um multimode fiber jumper with 100Gb reach up to 150 meters. Blue, zip-cord fiber optic patch cord, 2.0mm outer diameter, LSZH jacket. Length Options 2 Meter and 3 Meter length options available. Blue LSZH OM4 LC LC Fiber Patch Cable | 100Gb Duplex 50/125 Multimode Jumper. A Self Extinguishing, LSZH (low-smoke zero-halogen) jumper that's safe on the outside and fast on the inside. 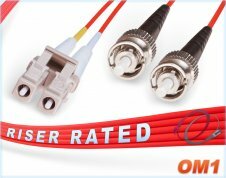 Accelerate your network to 100Gb with Corning laser-optimized multimode fiber (lommf), 50/125-micron core/cladding that extends your 100Gbps reach up to 150 meters, (backward compatible to OM3 and OM2). Assembled with blue, LSZH, 2.0mm outer diameter, OFNR riser rated, jacket that's zip-cord reinforced, immune to electrical interference and has an operating temperature of -20°C to +60°C. Pre-terminated with small form factor (sff), 1.25mm ceramic ferrule LC connectors that include pre-installed duplex LC clips. Safe, fast and easy to install/manage in high density cable environments, i.e., racks, between switches, transceivers, media converters, patch panels and other 1/10/40/100g fiber optic equipment. Supports Fast Ethernet, Gibabit Ethernet, SFP+, QSFP+, SR, SX, SR4, eSR4, SR10 and other provider applications. Optimized for VCSELs at 850nm. 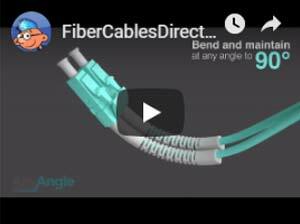 All fiber cables are tested in accordance with ANSI/TIA/EIA-455-171-A- 2001 attenuation standards by a qualified fiber optic technician and carefully packaged with test results and can ship the same day. Expedited delivery options for fiber cable orders include USPS and UPS 1 Day, 2 Day, 3 Day and Ground. FedEx also available for international orders.